Anti-poverty activist and scholar Peter Edelman during a recent lecture at Northwestern University Law School sponsored by the National Public Housing Museum. Photo by Mary C. Piemonte. It will take “a national groundswell of concern if we are going to make the progress we need on poverty,” said Georgetown Law Center Professor and author Peter Edelman during a lecture hosted by the National Public Housing Museum at Northwestern University Law School, 375 E. Chicago Ave., on October 10. Discussing the “growing chasm between America’s wealthy and poor,” Edelman said that “America has the highest poverty rate in the industrialized world,” with 46 million people living below the poverty line, a situation that could cause problems in the future. “Our democracy is in danger,” he said. Edelman, faculty director at the Center on Poverty, Inequality and Public Policy in Washington, D.C., is an antipoverty advocate and former legislative aide to U.S. Sen. Robert F. Kennedy who served as Assistant Secretary of Health and Human Services under the Clinton administration but resigned from his position to protest President Clinton’s support of welfare reform. The free public lecture, based on Edleman’s latest book, “So Rich, So Poor: Why it’s So Hard to End Poverty in America,” was part of the National Public Housing Museum’s “Profiles in Color: Race, Place and Identity Series” funded by the Ford Foundation and the Boeing company. 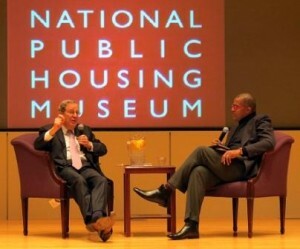 Peter Edelman being interviewed by National Public Housing Museum CEO Keith Magee. Photo by Mary C. Piemonte. While talking about government policies that he blamed for the increasing number of poor and impoverished citizens, Edelman said that the nation is losing “large numbers of disconnected youth,” mainly people of color in inner-city communities. Nevertheless, he added that the majority of people living in poverty were white. Edelman said that 50 percent of the income of those in poverty comes from working wages, especially for mothers with children. “As a result of globalization, of de-industrialization, we’ve become this low-wage nation,” Edelman said, citing statistics that half the jobs in the United States pay less than $34,000 while a quarter of the jobs pay less than what it would take to raise a family of four above the poverty line. Speaking in the weeks before the election, Edelman said, “You don’t hear about it much in the campaign, and that’s totally understandable. Certainly frustrating but, speaking for myself I’d like to see him re-elected,” he said to the delight of the audience. 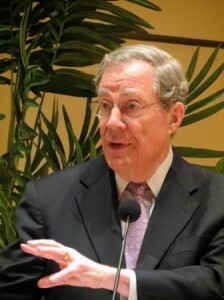 During the question and answer period with Edelman, a member of the audience said more needed to be done to reach the “hearts” of wealthier Americans to consider the plight of the poor. This entry was posted	on Friday, December 14th, 2012 at 7:06 am. You can follow any responses to this entry through the RSS 2.0 feed. You can leave a response, or trackback from your own site.